Bicycle lanes snake throughout the greater Boston area, with the purpose of providing a safe space for cyclists to navigate city streets. Unfortunately, many motorists fail to respect these lanes, choosing instead to use them for parking. At best, this is inconvenient for cyclists. Worst case scenario, however, it can be extremely dangerous, as it gives Boston bicyclists no other choice but to merge quickly into active lanes of traffic, significantly raising the risk of a crash. Whether motorists don’t understand or don’t care about the implications, it’s a serious problem and some communities are taking action. Specifically in Toronto, Canada, the city’s parking enforcement unit has begun an enforcement action coined a “bike lane blitz.” A full-time officer will be dedicated to enforcing bike lane parking violations. The officer is in charge of bicycling throughout the city, ticketing violators $150 a pop. The officer is also responsible for bike lane safety outreach and education, some on social media and in driving classes. However, the officer vows to issue a citation to every bicycle lane blocker he crosses. Part of the problem he sees is the need for a reset in public mindset of why this is important. As an example, he noted he ticketed a truck for blocking a bike lane on one street, only to loop around about 30 minutes later and see the same truck moved to the opposite side of the street. Delivery trucks, it’s reported, are repeat violators – and he puts them on blast using Instagram and Twitter. There have been some occasions wherein this public shaming has elicited a response, with companies like Pepsi promising it would look into the issue and advise its drivers on local ordinances. Social media has also become an important tool in directing the officer to where his patrol efforts should be focused. Those in the bicycle community are active participants, taking photos of blatant violators and recommending added enforcement to those areas. The concern about these kind of “blitz” operations is that while they work for a while, violators often revert to the same bad habits once the enforcement subsides for a bit. This supports the notion that such enforcement needs to be ongoing throughout the year. 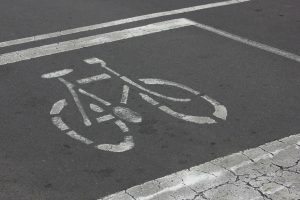 Our Boston bicycle injury lawyers know this city could benefit from a similar operation, as well as from a continued commitment to higher quality bicycle infrastructure that is better protected from motor vehicle traffic. For instance, drivers are physically unable to park in bike lanes protected by bollards, as opposed to those simply painted on the pavement. Cyclists who are injured as a result of bike lane blocking should (if possible) take photographs of the alleged violation to help support a case for damages against the parking violator. Our injury attorneys can help guide you through the legal process.